Once a thriving gold mining town, Bannockburn today is perhaps more famous for the numerous vineyards that pepper the dusty landscape. 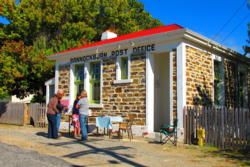 First settled in the 1860s, Bannockburn was an important transient stop for miners making their way around the various gold fields of the region, becoming a permanent settlement around 1868. Sluicing, damming and forced erosion drastically changed the landscape as mining took hold and, by the time the gold fields were exhausted, the aesthetic face of Bannockburn bore little resemblance to its original state. The miners eventually moved on, leaving behind a fascinating legacy of abandoned shacks, old mines, huts and tracks. There's still a population of around 120 permanent residents in Bannockburn, custodians of original buildings like the Bannockburn Hotel, the Stewart Store, and miners' cottages. A trek up to the ghost town of Stewart Town is a must if you want to get a real sense of the past, and the trail has some spectacular panoramic views along the way, too. 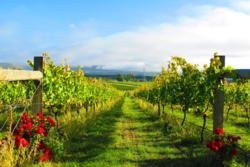 The main attraction of the area now, though, are the dozen boutique wineries and vineyards, many of which have cellar doors open to the public. The arid climate here – New Zealand's very own desert - is perfect for growing Pinot Noir. So, like most vineyards in the Gibbston Valley/Queenstown region, Bannockburn excels in producing world class vintages from this hardy grape. Mt Difficulty, Felton Road and Kingsmill are just three of the internationally recognised vineyards coming out of Bannockburn, and you could easily spend a day touring the whole list. Instead of basing yourself in Queenstown, though, take advantage of the many B&Bs and homestays in the region. 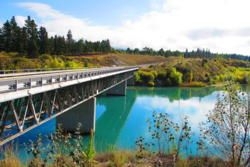 Cromwell, just across the Kawarau River, is the perfect place to book in for a few nights, as you explore Bannockburn. Spend some time 'walking and wining' in this unique desert landscape, and experience the famously friendly cellar door welcomes.